Demo: If the account is a funded trading account, disable the "Demo" checkbox. Otherwise, for free trials and demos, leave the “Demo” option enabled. 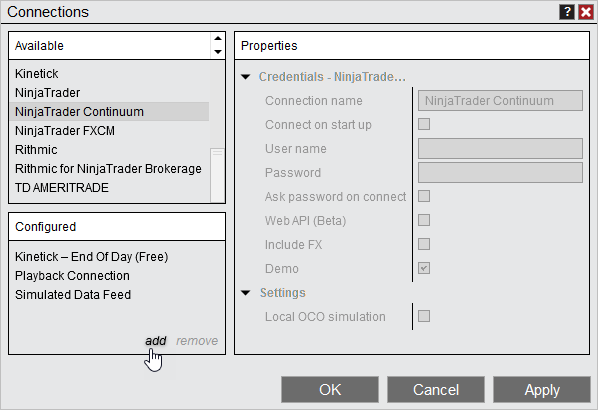 When cancelling orders, working orders within an OCO group will only be cancelled if any order of the group is cancelled directly within NinjaTrader. In all other scenarios these working orders will remain working. An OCO group that has an order rejected will not cancel any remaining working orders in the group. Any pending orders will not be submitted and instead rejected. There will be an approximate 200ms delay between submission of OCO linked orders. The time in force of ‘GTC’ (Good till cancelled) is not supported on Oanda accounts. Use ‘GTD’ (Good till date) orders instead. 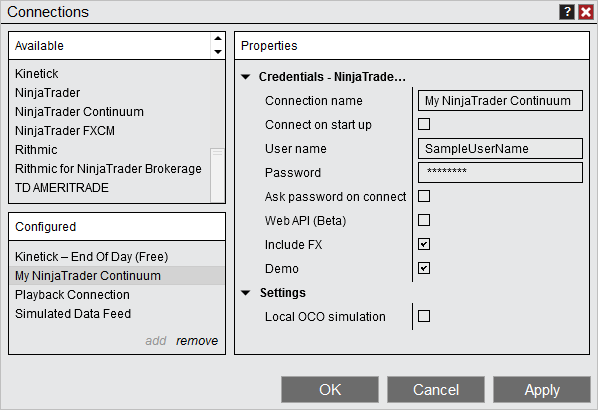 Oanda accounts can only have access enabled for NinjaTrader or Oanda's FXTrade platform. Accessing an account from both is not supported.